Acheson Creations has made it to their funding goal over on Kickstarter. 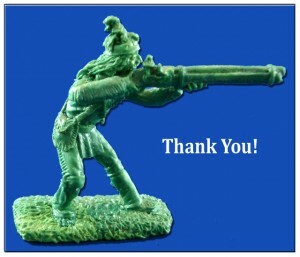 They've also posted up a preview green of the Iroquois Warrior that backers will receive. Thank you everyone! We're fully funded and that means everyone who pledged at the Tortoise level or higher gets a free Iroquois Warrior sculpt and we're going to finish up the masters and start prepping them for production! Woohoo! Thank you!